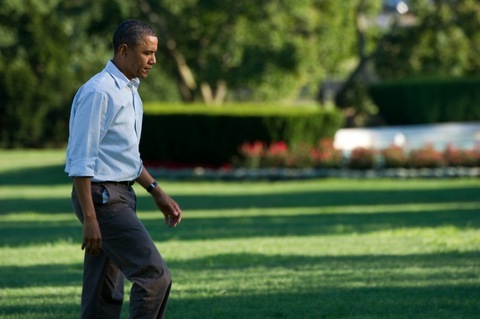 President Obama walks to the Oval Office on Monday after returning from a trip to Milwaukee. Photo by Nicholas Kamm/AFP/Getty Images. The new Washington Post/ABC News and Wall Street Journal/NBC News polls released Tuesday provide a double whammy of bad news for Democrats and the Obama White House eight weeks before the votes are counted and control of Congress is determined. If you’re looking for a silver lining for the Democrats in these numbers, it simply isn’t there. The one thing Democrats will, no doubt, try to highlight is that there’s no great love affair with Republicans among the voters. The part Democrats are likely to leave out is that it appears not to matter. Among likely voters, 53 percent say they would vote for a generic Republican candidate for Congress this year vs. 40 percent who say they would vote for the generic Democrat on a ballot. That 13-point GOP advantage is the largest in the poll’s history dating back to 1981. President Obama scores his lowest approval rating to date: 46 percent approve of the president’s job performance, while a slim majority, 52 percent, disapprove. The poll shows a six-point increase since July, from 32 percent to 38 percent, in voters who say the economy is getting worse. Helping to kick off the post-Labor Day political frenzy, two of Florida’s three Senate candidates will be out with their first television ads of the general election on Tuesday. There’s no mention of Meek’s two opponents — Independent Gov. Charlie Crist and Republican Marco Rubio — but the spot does look to highlight Meek’s positions on issues important to the Democratic base, such as the environment, Social Security and abortion rights.